First up is a surge protector that swivels. This one is good for extra wide wall warts. Next is the pyramid power adapter. You can outfit it with many wall warts and it also has USB charging ports. For those who like the traditional power-bar look, EZO makes one that has outlets that swivel. 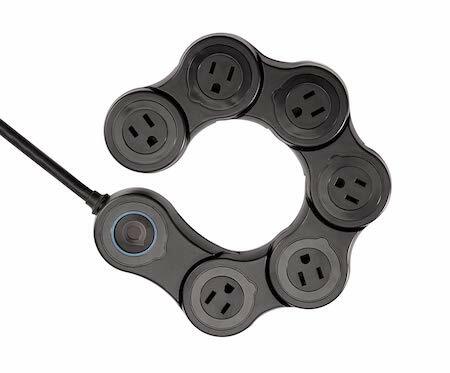 The pivot surge protector can handle several adapters and circle around the leg of your desk to save space. Remember, for safety’s sake, block off all unused outlets with plug covers to keep little fingers (and sometimes little cat claws) from going where they don’t belong. Let us know of additional wall wart space hogging solutions in the comments! I agree with Jeff above. Why no love for the PowerSquid? A veritable bouquet of plugs! ThinkGeek.com occasionally puts PowerSquids on sale for ridiculously low prices. The two in this room were $4.95 each. I don’t know what they’re called, but I always like the long power bars with the outlets spaced about 4 inches apart. They take up a little more space, but you can screw them to the wall or the back of a desk and they are out of site, but still easily accessible. Any one have any suggestions for solutions like this that suit UK plugs. We seem to get the raw end of the deal when it comes to this type of unlcuttering. I have good soldering skills, so I buy a 6′ brown extension cord (for usually < $1 on sale), and shorten it up to about 12″. For < $1 and a little work, I can use it as a one-to-three wall-wart expander. I’ve got a bunch of them laying around! I use this Philips surge protector. I had considered buying a squid, but this one is more compact and IMO more attractive. It works well with my combination of wall warts & regular plugs; the outlet covers slide closed for child safety; and wonder of wonders, it’s packaged in a cardboard box instead of bulletproof plastic! What the heck is a wall wart?? referencing Becky’s comment, I would like to leave my small chargers plugged in, but not draw power until I want to charge my phone, or other batteries. 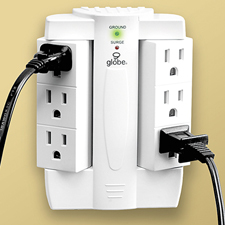 Does anyone know of a surge protector (a’la the Phillips unit above)which has an on/off switch for each outlet? Most chargers, if left plugged in, still consume energy even when we are not charging our devices. Manufacturers need to put on/off switches on the power strip, or on the charger. I didn’t know what wall warts were before this post ( I had to go look it up too, April E) and now that I do I don’t see how these things (particularly the first two) are supposed to work with them? The outlets still seem too close together. I wish Warts were plugged into them in the pictures to get a visual of how they’re supposed to work. 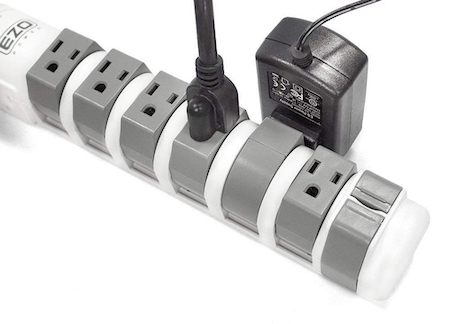 I have two power strips that I got at Home Depot a while back and they’re great because its double sided so it has I think 10 outlets but they’re spaced further apart so there’s room for ‘warts and all’ (someone had to say it). I just recently got it up off the floor and attached it to the back of my desk and it worked out great. I put my “charging station” full of wall warts on a timer. It’s only on and allowing charging when anyone is typically home. It’s switched off by the timer from 8:00am to 5:30pm M-F (I found a timer that can do days as well) and on all day Sat and Sun. works great and we are saving that 10 watts of power they consume when just sitting there during the day. @timgray: do you have a link to the timer you are using? I like the idea of one that is different on the weekend. @timgray – that’s a great idea to reduce power consumption…I wonder though, how much power does the timer draw? It seems like it would need some to keep time. This post inspired me to look for something more in a power board – our rooms only have 2 points and usually in the most inconvenient places, so wall warts are really not practical. I found the Belkin Conceal Surge Protector which fixed a lot of problems for me. We use this for our computer desk, but the remote makes it handy for any room. Like a light switch! I live in dorms I use a squid type adapter for by my computer and 2 regular multi-socket adapters: 1 for my microwave and TV, and another for my alarm clock and bedside lamp. At night, I only keep the alarm and lamp power strip on and the other 2 I just flick the button on them. 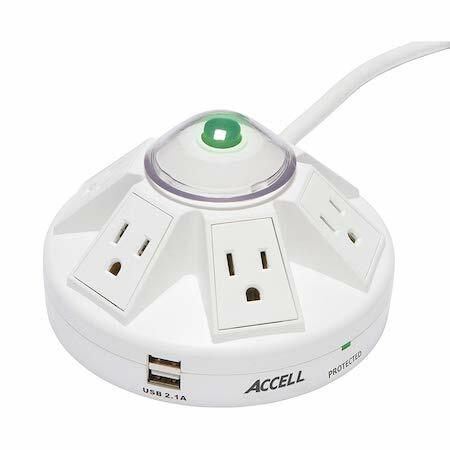 Not only does this help me save electricity, but it also stops all the LED lights in the room from annoying me when I try to get to sleep, and of course its a lot easier to press a couple of buttons than unplug everything. In the morning, I just turn everything back on. When I go back home for breaks, I turn everything in my room off. I know this is probably a year too late..
@Becky.. I use a Smart Strip on my tv. If the tv is on, only then will it power my dvd player, antenna, and video game consoles. That way, those appliances aren’t sucking energy while being used. Also note there is an on/off switch at the end that lights up so you can easily find it in the dark. @Rentaissanceman.. I use this at my front door. I have a socket that works off of the light switch by my front door, so when I walk in, I turn on my lights and my internet modem, router, and NAS. (why have your internet on when you aren’t home?) This works better for me than a timer because of my inconsistent schedule which normally brings me home after dark. This one also has an on/off switch.